1. Intake of nitrates from food. High-nitrates food include: beets, arugala, spinach, celery, and lettuce. Most root vegetables contain nitrates, such as carrots and radishes; also green beans, cabbage, collard greens, and parsley. Vegetables grown in hothouses can contain 5-10 times more nitrates than those grown in the field. Organic vegetables, grown without fertilizers, contain less nitrates than vegetables grown with fertilizers. (But this should not dissuade you from eating organic vegetables which have been grown using natural fertilizer.) Hawthorne berries are high in natural nitrates and provide the heart with extra protection as well. Pomegranate juice seems to protect nitric oxide from oxidation and enhances its biological activity. It seems that probiotics also provide nitric oxide from nitrite and nitrate. Nitrate is lost via peeling, washing, and cooking of fruits and vegetables. 2. Proper conversion of nitrates to nitrites is accomplished though salivary bacteria and proper chewing. Hence, use of antibacterial mouthwash—such as hydrogen peroxide, CDS, or Listerine—which can be helpful in removing problematic oral bacteria also kills the beneficial bacteria necessary for proper nitrate-nitrite conversion. Hence avoid antibacterial mouthwash and hydrogen peroxide, or use only at night, after the evening meal, allowing the body 12 hours or more to replace beneficial bacteria. 3. Ample amounts of Vitamin C in the system naturally inhibit the conversion of nitrates to harmful nitrosamines. Supplementing with Vitamin C (particularly in the form of ascorbic acid) may not be the answer if the body is too acidic is unable to utilize Vitamin C. It is best to use the neutral form of Vitamin C as found in scallion (green onion) soup, or in the form of DHAA (dehydro-ascorbic acid). See the link “Immunity Boosting” for instructions on how to make DHAA. (Also, low levels of Vitamin A inhibit the utilization of Vitamin C; so, it may be necessary to increase Vitamin A levels using cod liver oil or Vitamin A supplementation. A water-soluble form of Vitamin A is preferable.). The conversion of nitrates into nitrites begins in your mouth and culminates in your stomach. 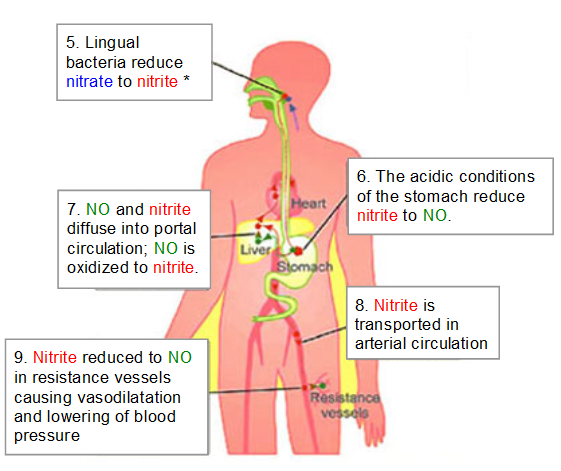 Depending on various factors such as stomach pH, body temperature and the presence of antioxidants, sodium nitrite is either converted into nitric oxide or compounds called nitrosamines. Nitric oxide helps blood vessels relax, lowers blood pressure and displays mild anti-inflammatory activity. In contrast, nitrosamines are considered undesirable because they are potentially carcinogenic and damaging to tissues. Nitrates can turn into nitrosamines - cancer causing compounds. Nitrates are present in the human saliva, as well as in some preserved foods. Nitrates turn into nitrosamines more easily in acidic conditions, such as the environment in the stomach. Usually, vitamin C converts nitrite into nitric oxide, thus inhibiting the formation of nitrosamines. This study was done with Vitamin C in the form of ascorbic acid and not in its natural form (which would include additional cofactors and antioxidants.) Natural plant-based sources of nitrates and nitrites contain vitamins C and E, which inhibit the formation of nitrosamines in the stomach. 4. 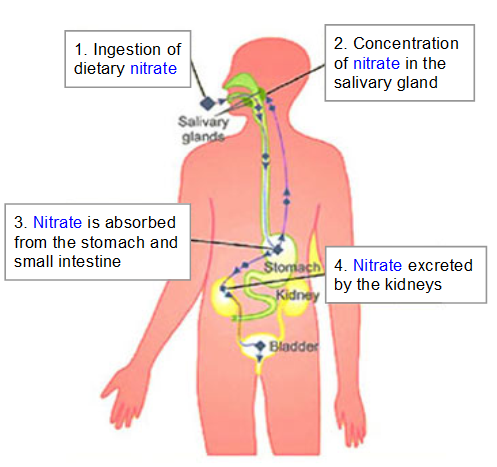 Proper amounts of stomach HCl are needed to convert nitrites to NO. Hence, chronic cases of low stomach acid, or hypochloria, can lead to chronically low NO levels. (To remedy this, take HCl about 45-60 minutes after eating. Take in small amounts and increase over time. In general, you should feel a warm feeling in the stomach when enough HCl is taken. If you feel a burning sensation you may have taken too much. Just take a little baking soda (or potassium bicarbonate) to reduce the acid a little. The best form is liquid HCl, which can be purchased as drops or better yet as HCl crystals which can be mixed in water. Be very careful to drink through a thin straw, avoid contact with the teeth, and immediately brush the teeth with baking soda or natural toothpaste after ingesting liquid HCl. In general, when supplementing with digestive enzymes, take the enzymes before eating or during the meal; then follow up 45-60 minutes later with HCl. HCl tends to deactivate some digestive enzymes so it is best not to take with the meal. Only take HCl with a high-protein meal and in amounts equivalent to the amount of protein intake. 5. The amino acid Arginine is an important indirect precursor of NO; it also increases plasma nitrate and nitrite and thus enables NO production. Another amino acid, citrulline, is converted to arginine, yet citrulline may support the NO cycle is ways that arginine does not. Hence, supplementation with citrulline is generally preferred over arginine. 6. Fish oil is particularly useful in reducing cardiovascular inflammation (as well as promoting many other health benefits). So, regular intake of fish oil (in liquid form, not pills) is advisable. To prevent oxidation, it is best to take fish oil with a natural anti-oxidant, rice bran solubles (which contains all forms of tocopherols and tocotrienols) is preferred. Eat beets, spinach, arugala, celery, lettuce, carrots, etc. Manage fructose intake and avoid all forms of high fructose corn syrup. Keep up Vitamin C levels using scallion soup or DHAA.